How did this patient hear about Jupiter Rehabilitation and Healthcare Center ? Mother was here previously. Mark Vadas was admitted to Jupiter Rehabilitation and Healthcare Center on March 14, 2018. He went to the hospital for a right total hip arthroplasty on March 12, 2018. 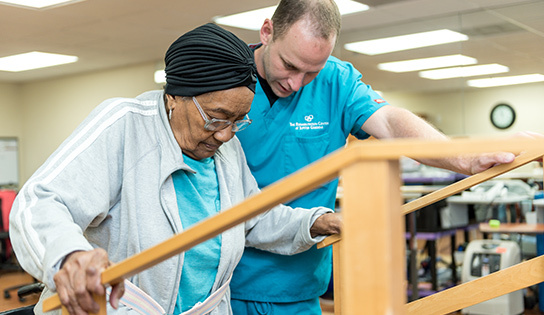 At the time of evaluation, Mark needed moderate assistance with bed mobility and transfers. During gait training, he required minimum assistance and walked a distance of ten feet with a rolling walker. After two weeks of intensive physical and occupational therapy, Mark showed significant progress in all levels of function. Mark’s first experience with the facility was twelve years ago, when his mother was here. It was hard for Mark to come back, but ultimately decided this was the best place for rehab. The experience he had here with his mom was excellent. He felt comfortable selecting Jupiter Rehabilitation and Healthcare Center , even though he just wanted to go home after the hospital. Mark’s therapy experienced changed his outlook on going to a rehabilitation center. “I would recommend therapy for anyone. It transforms you into a rejuvenated person,” shared Mark! He enjoyed and respected the persistence of the therapy team, specifically Renee, whom he has identified as his “ray of sunshine” while in the facility. Mark received both physical and occupational therapy to strengthen his upper and lower body. The staff here at Jupiter Rehabilitation and Healthcare Center is excited to see Mark become independent once again. “The therapist gave me the tools to perform many of my own functions and not have to rely on my wife.” He also enjoyed the newly renovated room he was in. As an interior designer, he thinks the color schemes in the room are terrific. He has also asked the chef for some of his recipes, as the dining experience here was magnificent. Mark is now able to get up from bed and transfer at a modified independent level. He is able to dress himself in the morning with good safety techniques. He is walking with a rolling walker at a modified independent level and is preparing to go home with his wife. Mark is always very motivated during therapy sessions and has worked hard with his therapist to return home safely. As a member of the coast guard we are honored and proud to serve Mark.